And, then she would pee on the kitchen floor. This was all before lunch on Saturday. By the end of the day, we were worn down. I got in touch with two of my good friends and asked their advice. The first one said, ‘potty training is the worst. The first time we attempted it was such a failure that we put the diapers back on.’ Thinking I would get better advice from my other friend, I was not prepared for her statement of, ‘it was the darkest period of my life. A three year old outsmarted me and totally broke me.’ Now, both of these friends have potty trained children who seem totally normal so they had to do something right. Neither one of them had any good advice but said to stick with it. Then Miss H in full protest of the whole potty training adventure decided to just hold it. She held it from 9pm on Saturday until noon on Sunday. Yep, that’s right, that little bladder is pretty strong. At this point on Sunday, breaking all the rules of the boot camp, we just stopped talking about the potty and decided to go about our normal day. We went to visit friends who just had a baby. We went to Target. Miss H was holding it again. One of my friends mentioned above was having a cookout so we decided to chance it and head over to her house. She understood our stress. She showed Miss H were the potty was and opened the bathroom cabinet to reveal a trove of stickers. We enjoyed nice company, food and others stories of potty training. After doing her ‘I have to potty dance,’ around the living room, Miss H announced she needed to potty. The whole group erupted in applause and off she ran to the bathroom. And, she did go. When I gave the thumbs up to the group, another round of applause erupted. Our daughter is a total ham so this was well received. Plus, she got stickers. Kerry and I looked at each other and just laughed. We were not total failures as parents. Today on Day 4, we are cautiously optimistic about her progress. She tells us when she needs to go and we are not harassing her with the constant inquiries about the potty. It seems to be working. And, she loves that every time she goes to the potty that she gets some type of toy/treat/sticker and lots of clapping. The bribery method seems to be working for us. 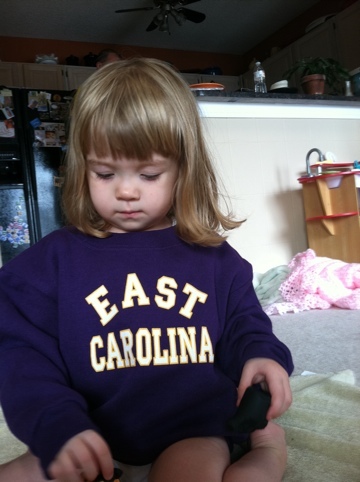 Mom stopped by on her way back from North Carolina with an East Carolina sweatshirt for Miss H. She loves the purple! 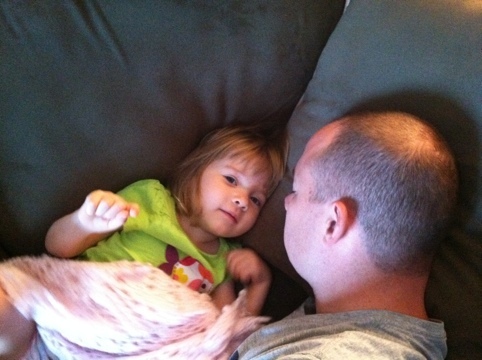 Today (Sept. 6th) is our Day 4 of the 3 Day method with our 2.2-year-old. I have to agree with your friend – it was a dark period of my life over the long weekend. Things are definitely improved dramatically but not perfect. Still haven’t had the guts like you to take my daughter out in public alone. Cheers to you! And to me! And to all parents going through this. Best of luck! I feel your pain! Potty training is a doozy … but the investment is so worth it! I wrote a post about my fourth’s potty boot camp – my no-holds-barred exhausting but true play-by-play! She’s a potty pro now … so hang in there! It will happen! Potty training boot camp! Very cute way of putting the most difficult aspect of raising a toddler. Yet you guys are doing it! The good news is, in a few years, it will all be a blur, so it’s not a bad memory that you carry with you for life. I am about to go through potty training with my second and I’m not looking forward to it. If you want advice from a new reader, we had it pretty easy with my first son when it came to potty training. We put the potty in the living room and told him that he could get 1 skittle if he peed in the potty and two if he pooped in the potty. We didn’t make a big deal out of accidents. I read somewhere that it takes a child repeating something 9 times before it becomes a muscle memory. So, if there was an accident we just took him where the accident happened and then walked him to the potty and told him that he should potty in there. We would run back and forth from the accident to the potty 9 times. We even made a game of it. It took 2 weeks and we were done! Good luck! Stopping by from SITS…didn’t intend to get all know-it-all-ish on my visit though!